David Wallace-Wells, the writer for New York magazine who jolted us last year with his searing climate-change story, The Uninhabitable Earth, has posted a follow-up, UN Says Climate Genocide Is Coming. It’s Actually Worse Than That. You guessed right, the sequel is about the new IPCC report. We began the week covering the report’s first-time recommendation of a high carbon price to drive emission reductions. We can’t fully do justice to Wallace-Wells’ latest with a summary — it’s too layered for that. To convey a sense of his argument and his urgency, we’re excerpting five key passages (disclosure: some are longer than mere sentences), with comments. Carbon Tax Center: It’s worse than that. The most likely “shape” of the planetary climate-damage curve (or function) is a quadratic. (See graphic, from our June 2017 post, Showing the Cost Side of the Damage Equation in a New Light.) 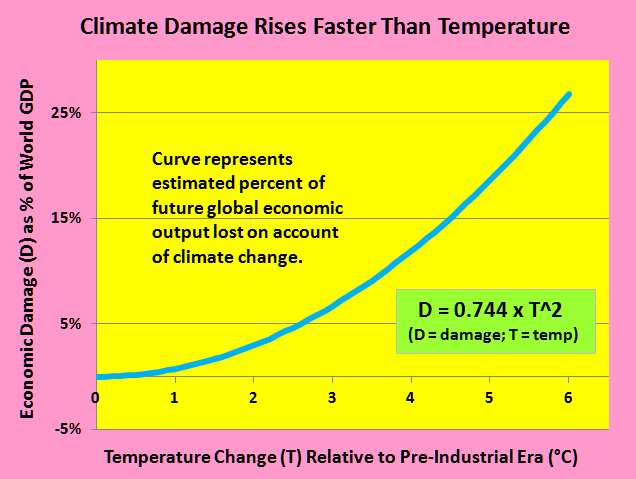 Doubling the temperature rise doesn’t double the damage, it quadruples it. Tripling the rise magnifies the damage nine-fold. 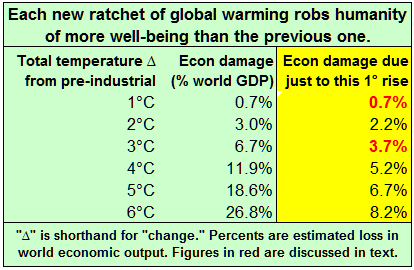 The silver lining, if there is one, is that each increment of temperature rise we can prevent through societal action pays back more than proportionately in damage avoidance. DW-W [this sentence is from his previous passage]: New carbon-sucking technologies … are so far from scalability at present that they are best described as fantasies of industrial absolution. DW-W: Because the numbers are so small, we tend to trivialize the differences between one degree and two, two degrees and four. Human experience and memory offers no good analogy for how we should think about those thresholds, but with degrees of warming, as with world wars or recurrences of cancer, you don’t want to see even one. CTC: Goodness, yet another way in which human cognition militates against fully grasping and grappling with climate change. We thought Dale Jamieson’s magnificent 2014 book, Reason in a Dark Time: Why the Struggle Against Climate Change Failed, and What It Means for Our Future, covered all the obstacles to understanding and action: It’s hard to attribute the myriad consequences we see in the world to climate change… Evolution built us to respond to “rapid movements of middle-sized objects,” not to the slow buildup of insensible gases in the atmosphere. And of course, climate change is the world’s largest and most complex “collective action problem,” in which each of us, acting on our own desires, contributes to outcomes we neither desire nor intend. And many more, to which Wallace-Wells has added the new one, above. DW-W: Nothing in the IPCC report is news … not to the scientific community or to climate activists or even to anyone who’s been a close reader of new research about warming over the last few years. That is what the IPCC does: It does not introduce new findings or even new perspectives, but rather corrals the messy mass of existing, pedigreed scientific research into consensus assessments designed to deliver to the policymakers of the world an absolutely unquestionable account of the state of knowledge. CTC: That’s helpful to those of us in the trenches. It aids us in seeing why the release of old news — include the lede that limiting the earth’s average temperature rise to 1.5°C is pretty much off the table — was served up by important media as news, period. CTC: Yesterday we posted the comment by our colleague Thomas Sterner, declaring that Nordhaus’s “choice to label the 3.5°C [temperature rise] as optimal is … unfortunate.” Today we would rather dwell on the brighter side, that the IPCC for the first time called not just for a carbon price but for a high one, as we reported on Monday. DW-W: A carbon tax is only a spark to action, not action itself. CTC: Yes … and no. No, because a robust carbon tax will be far more than a mere spark — it will stimulate enormous changes in behavior, investment, decision-making and innovation, all of it toward vastly lessened use of carbon fuels. Yes, because the tax itself doesn’t reduce emissions, rather it instills incentives that will provoke the reductions. We think the article is well worth reading. Let us hear your take. Addendum, Sept 19: The Trump administration yesterday formally adopted the proposed rules we wrote about last week, below. The New York Times’ Lisa Friedman reports the details. “This is insane – it borders on criminality,” said California Gov. Jerry Brown yesterday about President Trump’s proposed revisions to Obama administration regulations on methane emissions from oil and gas wells. Brown has authority to speak, and not just because on Monday he signed SB (California Senate Bill) 100, which commits the Golden State to a 100% carbon-free electricity sector by 2045. Brown’s entire 16-year career as governor (1974-1982 & 2008-2016) has been one of breathtaking, broad-based innovation in energy efficiency, renewable energy and environmental protection. The longest-serving governor of the largest state pulls no punches. Not just in California but across the U.S., fridges and A/C’s consume less electricity, cars burn less gasoline, and tailpipes pollute less because Brown’s administrations pioneered the required engineering, regulations and politics. If any human being living or dead has done more than Gov. Brown to cut carbon emissions, I’d like to know her name. The Obama reg’s targeted natural gas leakage, venting and flaring by requiring more frequent inspection of leaks from gas wells and pipelines and expedited repairs. The Trump revisions will cut inspection frequencies at wells and compressor stations and extend repair deadlines, as reported yesterday by Romany Webb, Senior Fellow and Associate Research Scholar at Columbia University’s Sabin Center for Climate Change Law. Watering down the Obama rules will mean more heat-trapping methane released to the atmosphere. Exactly how much more methane is hard to pinpoint but EPA estimates appear to be around 50,000 excess tons in 2020, rising to just over 100,000 in 2025. (Those are the two years displayed in Table 1.1 of EPA’s Regulatory Impact Analysis; the figure rises over time because the Obama reg’s being watered down apply to new wells only.) We’ll use the approximate 2025 figure, 100,000 tons per year as representative of the next 10-15 years. “Methane is a highly potent greenhouse gas,” Ms. Webb reminds us in her informative post, “trapping approximately 87 times more heat in the earth’s atmosphere than carbon dioxide in the first 20 years after it is released, on a pound-for-pound basis.” Applying that multiplier, the additional 100,000 tons of methane per year will have the same climate-change impact as 8-10 million tons a year of additional CO2. Total U.S. emissions of CO2 currently run between 5 and 6 billion tons, while emissions of methane and other GHG’s add the equivalent of another 1 billion or so (all figures are in short tons and are approximate). The Trump/EPA rollback will thus add less than two-tenths of one percent (0.2%, or one part in 500) to America’s climate pollution emissions. If the rollback’s numerical impact is so small, why is it so odious? First, the Obama rules being watered down were the opposite of revolutionary; they adhered to the time-honored (and bipartisan) pollution-control paradigm of covering only new or expanded emissions sources, an accommodation that circumvents arguably costlier “retrofitting” of existing sources. Second, they’re eminently doable. Inspecting and fixing leaky wells and other gas infrastructure is good housekeeping, pure and simple. And they’re easy to follow. Third, the methane rules bring substantial co-benefits: They create jobs. They cut down on “local” (toxic) pollution. They protect workers. And they’re at least partially cost-offsetting since the saved methane can be delivered and sold. Last, as OCI reminds us in its mission statement: The production and consumption of oil, gas, and coal are major sources of global warming, human rights abuses, war, national security concerns, corporate globalization, and increased inequality. Anything that further incentivizes fossil fuel extraction and usage, as the Trump-EPA methane reg rollback will do, only exacerbates that. In short, the rollback is quintessential Trump: spiteful, short-sighted, ignorant, amoral. Jerry Brown is right on Trump and right on climate. He’s wrapping up his lifetime of public service on the highest possible notes of policy, leadership and moral clarity. The opposite of what we suffer with the White House. 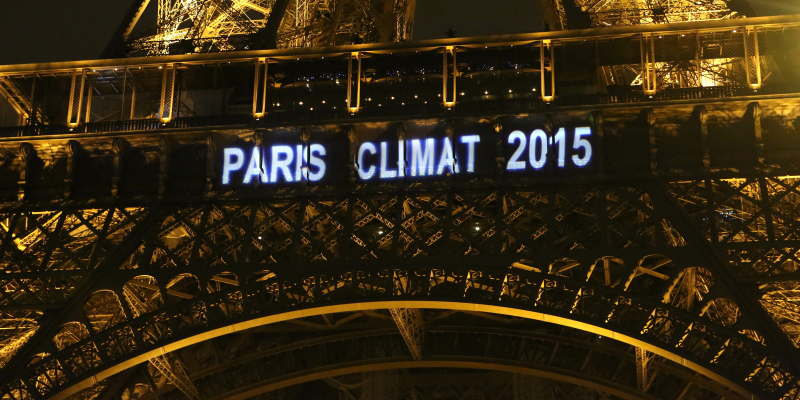 Just How Scary Is 2015’s Temperature Record? We Count the Ways. Even for folks hardened by decades in the trenches fighting climate change, the release yesterday of 2015 planetary temperature data was still shocking. The “global land and water temperature” didn’t just set another record last year, it changed the rate at which those records are being set. The 2015 anomaly was 0.90 degrees Celsius (1.6 degrees Fahrenheit; except for graph excerpt at right, all figures here are Celsius); in other words, last year’s global average temperature was almost a full degree above the 20th Century average. The 2015 temperature anomaly was 0.16 degrees greater than the anomaly for 2014, making last year’s increase the biggest since 1997 — even though the 2014 anomaly had just set a new record. The trendline we drew through 1975-2015 temperature data has a nearly 4 percent steeper slope than our year-earlier trendline for 1975-2014 data. 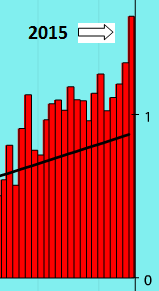 Adding 2015 data in effect lifts the prior trend from its moorings, like an earthquake, tilting it upward. Not only is our planet much hotter, the pace of warming has gotten much faster. 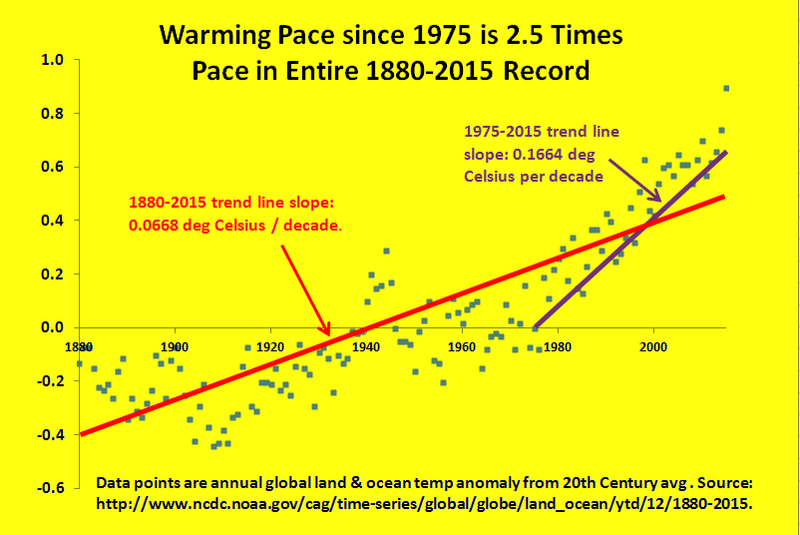 The trendline running through the entire 1880-2015 NOAA/NCDC dataset yields an average rate of temperature rise of 0.0668 degrees per decade; it’s probably easier to multiply that by 10 to derive a per-century rise of two-thirds of one degree. However, a trendline on just the most recent 40 years, 1975-2015, gives an average rise of 0.1664 degrees per decade, or one-and-two-thirds of one degree per century. Over the past 40 years, temperatures have risen 2.5 times as fast as they have over the entire 135-year record. [I]f anybody still wants to dispute the science around climate change, have at it. You will be pretty lonely, because you’ll be debating our military, most of America’s business leaders, the majority of the American people, almost the entire scientific community, and 200 nations around the world who agree it’s a problem and intend to solve it. It’s hard to discern the extent to which the denialism running through the Republican Party is driven by ideology or by politics, especially since the two are strongly intertwined. At some point, reality will come into play. Temperature data can help that happen. So can election returns. The worldwide fossil fuel divestment campaign got a huge boost this week when Guardian editor Alan Rusbridger boldly thrust his paper into the fray. Britain’s most respected newspaper is urging readers to sign a petition by 350.org demanding that the Gates Foundation and the Wellcome Charitable Trust divest from the world’s top 200 fossil fuel companies within five years. Divestment can’t loosen the fossil fuel stranglehold without a carbon tax. Combined, the two charities manage over $70 billion in assets. Both say they consider climate change a serious threat. But last year the Gates Foundation invested at least $1 billion of its holdings in 35 of the top 200 carbon reserve companies, while the Wellcome Trust invested $834 million in fuel-industry mainstays Shell, BP, Schlumberger, Rio Tinto and BHP Billiton. We’re both elated and concerned by Rusbridger’s audacious move. Elated that this distinguished and brave journalist has thrown down the gauntlet to the global fossil fuel industry. But concerned that this divestment campaign may raise false hopes. As Matthew Yglesias articulated last year in a thoughtful piece on Slate, divestment by socially responsible investors, universities and even governments won’t starve capital flows to fossil fuel corporations anytime soon. That’s because in a global market, every share of stock we activists dutifully unload will be snatched up in milliseconds by some trader who can bank on humanity’s continued dependence on fossil fuels to continue generating profits. South Africa’s historic divestment campaign — the one that helped topple Apartheid and enshrined divestment as a tool against oppression — was paired with a UN-sponsored boycott of South African goods. Not just aiming at the supply of capital but destroying the demand for goods sheared the Apartheid regime’s economic lifeline to the rest of the world more than either policy could have done alone. 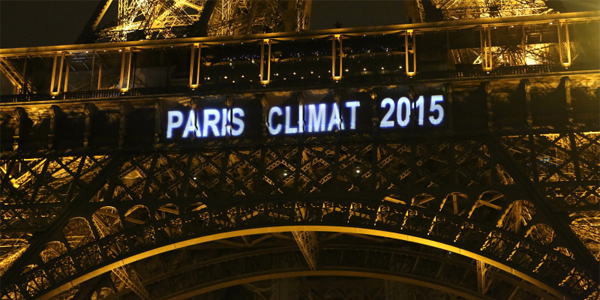 No, we’re not suggesting a global boycott of fossil fuels. Rather, we point to the Guardian’s campaign to reiterate that the best and maybe only broadly effective way to reduce fossil fuel demand (which is the point of a boycott) is with a carbon tax. Economists agree on that policy prescription just as strongly as climate scientists agree on the diagnosis. And national-level carbon taxes can be designed to draw our or any nation’s global trading partners into carbon taxing, which means that a move by a big economy to impose a carbon tax will trigger a wave of followers. So by all means, divest. The cultural and perhaps political opprobrium that divestment can spark is long overdue for the fossil fuels industry. 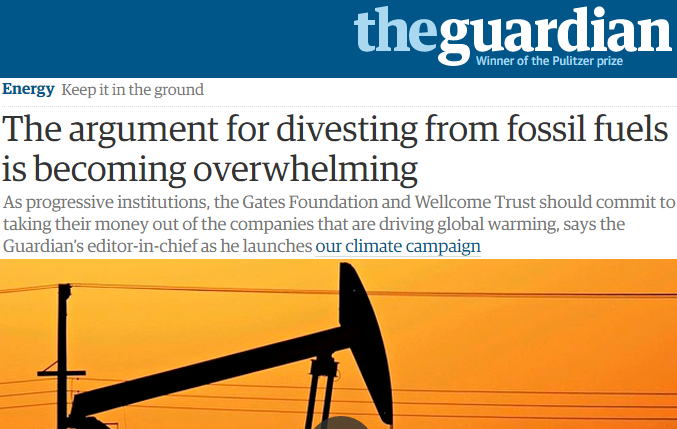 But let’s not assume that divestment alone will break the chains of fossil fuel dependence. Even with the Guardian’s welcome campaign, the world still needs a transparent price on carbon pollution to strangle demand for fossil fuels by replacing them with non-carbon alternatives. Is the rift between Nordhaus and Stern evaporating with rising temperatures? Lead author of this joint post is Peter Howard, Economic Fellow at the Institute for Policy Integrity at New York University School of Law. The political task of enacting carbon taxes ­― and maintaining those in place ― has proven so daunting that questions of the tax’s appropriate level have gotten short shrift. Carbon tax advocates do not often discuss: How high is the optimal carbon tax? Along what trajectory should it increase over time? What, if anything, can climate science tell us about the right carbon tax to aim for? 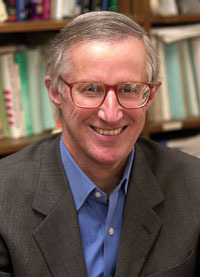 In the academic realm, the distinguished Yale economist and public intellectual William Nordhaus has taken a leading role in the discussion. 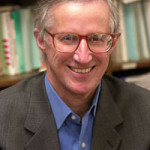 Nordhaus first modeled energy-economy interactions in the 1970s, and since the early 1990s successive versions of his Dynamic Integrated model of Climate and the Economy, or DICE model, have been used to estimate costs and benefits of carbon mitigation strategies in one prestigious report after another ― most recently in the Fifth Assessment Report by the UN Intergovernmental Panel on Climate Change (IPCC). Given Nordhaus’s concerns over global warming, reflected in his ongoing repudiations of climate change denialists as well as his impatience with cap-and-trade schemes, it has been jarring for some to see him advocate for a relatively low carbon tax. In his 2008 book, A Question of Balance, which relied on the 2007 version of DICE, Nordhaus proposed a year-2005 starting price of just $8 (U.S.) per short ton of CO2 (from his Table 5-4, adjusted to 2012 dollars and recalibrated from metric to short tons and from C to CO2), which would then take two decades to double and another 30 years to double again. In contrast, the Carbon Tax Center and its allies at the Citizens Climate Lobby have long advocated a steeper, stepwise ramp-up, with an initial price of around $10 per ton of CO2 followed by annual increases of the same magnitude for at least a decade and perhaps much longer. 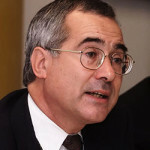 This policy recommendation is more in line with the views of Nicholas Stern ― lead author of the Stern Review on the Economics of Climate Change (2006) ― who argues that strong climate policies are necessary immediately to forestall large future damages from global warming. In the past, Nordhaus (along with several other economists) disregarded these findings based on the low discount rate assumed in the report. Recently, however, this difference in opinion between the Nordhaus and Stern camps with regards to policy (though not discount rate assumptions) has lessened. Using the latest version of the Nordhaus model, DICE-2013, Nordhaus finds an optimal initial (2015) carbon price of approximately $21 per short ton of CO2 in 2012 U.S. dollars (a near tripling from DICE-2007). Moreover, the optimal tax according to Nordhaus rises more rapidly over time as compared to DICE-2007. A tax of this amount would restrict the average global temperature increase to approximately 3 degrees Celsius above pre-industrial levels. 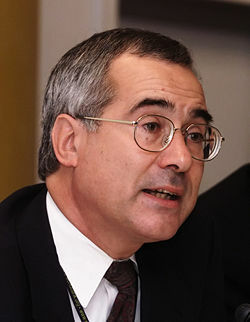 As economist-columnist Paul Krugman noted in his review of Nordhaus’s 2013 book, The Climate Casino, in the NY Review of Books, even Nordhaus seems surprised by his finding that both the international consensus of a 2 °C limit and the carbon tax necessary to achieve it are nearly economically rational. And given that DICE-2013 fails to account for climate tipping points (as Nordhaus himself notes), an even lower temperature limit and higher carbon tax are justifiable. Stern has now taken this recent scholarship a step further. In a June paper co-authored with economist Simon Dietz, Stern demonstrates that the DICE framework can support an even stronger mitigation effort than the latest Nordhaus specification of the model.Their paper, “Endogenous growth, convexity of damages and climate risk: how Nordhaus’ framework supports deep cuts in carbon emissions” (co-published by the Centre for Climate Change Economics and Policy as Working Paper No. 180, and by the Grantham Research Institute on Climate Change and the Environment as Working Paper No. 159), is not a rehash of the Stern-Nordhaus dispute over discounting. Rather, the paper accepts Nordhaus’s choice of discount rate for argument’s sake but modifies the 2010 edition of Nordhaus’s model in three critical ways. First, whereas DICE-2010 counts only economic costs from climate damage to current consumption (e.g., decreased agricultural productivity, loss of coastal habitation, etc. 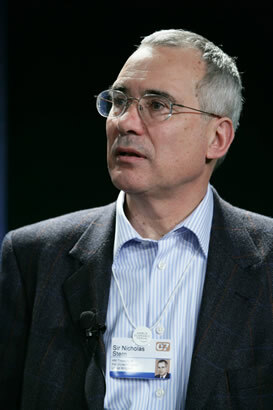 ), Dietz and Stern contend that climate change will also erode the ability to generate new wealth by inhibiting the accumulation of physical capital and impeding overall learning in the economy, i.e., the accumulation of technological and intellectual capital; both of which are key drivers of economic productivity and growth. Second, Dietz and Stern conclude that Nordhaus’s model specification of the climate “damage function” ― the function that translates increases in temperatures into declines in GDP ― also needs to be modified to reflect possible climate tipping points such as those emphasized in the recent IPCC report, “Climate Change 2013: The Physical Science Basis.” Dietz and Stern note that, as presently constituted, the DICE-2010 model leads to the unrealistic result that nearly three-quarters of world economic output would survive an average global temperature increase of 12 °C (22 °F). Nordhaus himself notes this anomaly for DICE-2013 in his latest book, and states that climate tipping points and the large damages associated with them could potentially occur with temperature increases as low as 3 °C. Third, Dietz and Stern update the DICE model’s “climate sensitivity” parameter, which relates atmospheric levels of greenhouse gases to expected temperature increases and other climate impacts. These updates reflect recent findings from climate models, including the higher probabilities assigned to climate tipping points such as methane emissions triggered by melting permafrost. This change would bring DICE in line with the latest versions of other Integrated Assessment Models, such as Richard Tol’s FUND model and Chris Hope’s PAGE model. As a guide, we find that these models suggest the carbon price in a setting of globally coordinated policy, such as a cap-and-trade regime or a system of harmonised domestic carbon taxes, should be in the range $32-103 [per metric ton of CO2] (2012 prices) in 2015. It must be remembered that the DICE model lacks adjustment costs, so the high end of the range should be interpreted cautiously. On the other hand and potentially of great importance, we have . . . omitted important risks in relation to the distribution of damages, which could give higher carbon prices. Within two decades the carbon price should rise in real terms to $82-260/tCO2. Doing so would, according to the model, keep the expected atmospheric stock of carbon dioxide to a maximum of c. 425-500 ppm and the expected increase in global mean temperature to c. 1.5-2 °C above pre-industrial. Given that Nordhaus finds an even stricter temperature limit using DICE-2013 than DICE-2010 (i.e., approximately 3 degrees Celsius instead of 3.5 degrees Celsius), even more ambitious temperature limits and carbon taxes are economically rational. The results of both Nordhaus (2013) and Simon and Dietz (2014) demonstrate that the DICE model supports ambitious climate policies ― potentially even the temperature limit agreed upon under the Copenhagen Accord. Thus, while Nordhaus and Stern may differ on whether a carbon tax should be imposed as a ramp or a steep hill, and on the appropriate discount rate for converting anticipated future damages to present terms, this debate is progressively less relevant as the steepness of this ramp increases with model sophistication and the further delay of a carbon tax. If steps are not taken soon to achieve optimal greenhouse gas emission reductions, the slight distinction between their respective optimal climate plans will likely grow even smaller – mooting any remaining disagreement over the tax’s appropriate level. Figure 14 in the DICE-2013 Manual. In a recent update of DICE-2013 (i.e. DICE-2013R), Nordhaus finds an optimal initial CO2 price of approximately $19 per short ton of CO2 (in 2012 USD); this is a 239% increase from DICE-2007. Figure 8 in the DICE-2013 Manual. Dietz and Stern (2014) find that the optimal mitigation path in DICE-2010 implies a temperature increase of up to 3.5 °C above pre-industrial temperatures. 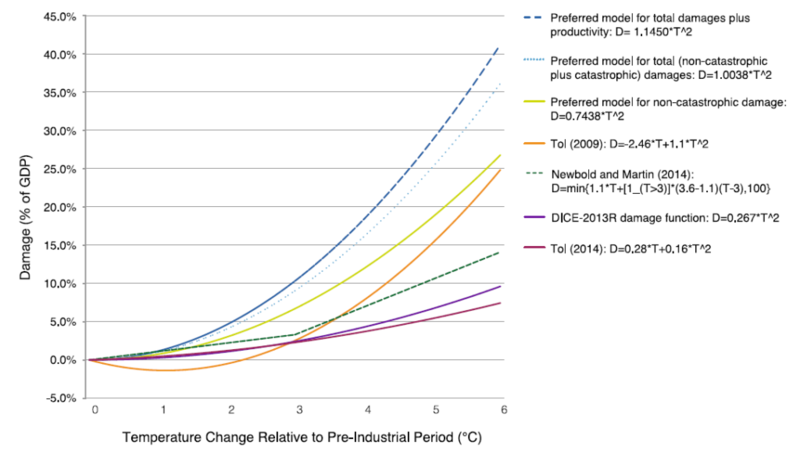 DICE-2013R seems to fall somewhere between DICE-2010 and DICE-2013 in terms of the optimal temperature increase. Photos courtesy of Yale University and Wikipedia, respectively.